This quote by Oscar Wilde emphasizes that the price of something does not have to be the value for the thing. The price of a company differs from its value. The value can be calculated with several methods by analyzing and assuming the current and the further situation of a company. In contrast to the value the price is just a financial compensation. Supply and demand determine the price. The value is influenced by the economic circumstances of a company and as well as the current and the further outlook of a company. The price depends on the involved parties. There are always a buyer and a seller. The buyer wants to the smallest price and the seller wants to get the highest price. Therefore, the interests from the parties differ and they have to negotiate an acceptable price. For this reason, each evaluation is done for a special occasion and the occasion is very important for the price of a company. The value does not differ but it is impossible to find the right value. The value is influenced by someone’s opinion and it is not able to separate each opinion. There are always a lot of results for a corporate value and everybody tries to influence the price for his own benefit. The Discounted Cash Flow (DCF) and the multiplier approach are the most important methods which are used in practice. Due to this, the assignment discusses these approaches theoretically. After the theoretical discussion, these approaches are used to determine a value for the Fielmann AG on December 31st 2011. Starting with the framework of corporate evaluation, the economic and legal conditions as well as the occasions for evaluation will be introduced. This is followed by a detailed presentation of the theoretical methods to evaluate a company. In this regard the liquidation and the reproductive value within the net asset value methods are going to be explained. However, the main emphasis of this assignment is on the discounted cash and the multiplier approach. Therefore the entity and equity approach within the discounted cash flow method will be provided. A detailed presentation of the multiplier principles will finish this theoretical chapter. Due to the practice of this assignment Fielmann is going to be evaluated in the next chapter. This starts with a company introduction of Fielmann mentioning the main business subject, the current business situation as well as the company perspective. After that the company’s value will be determined within the previously theoretically presented discounted cash flow approach. 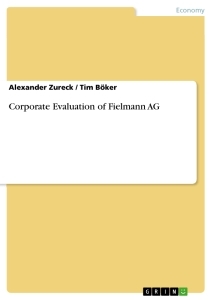 Therefore, Fielmann’s cost of capital is calculated and used regarding the entity and equity approach. This is followed by the company evaluation in terms of the multiplier method. Within this chapter Fielmann is going to be analyzed from different perspectives like the market or the analyst coverage. Based on this, the peer group will be established and the multiplier calculation will be provided. A summary of the different approaches resp. results as well as the discussion of the advantages and disadvantages of the methods will be given within the conclusion chapter. Corporate Evaluation is discussed in science and practice. From time to time, there are a lot of new methods to evaluate a company, e.g. the real options approach. An evaluation depends on a special occasion. The assignment will present the most important methods and occasions for a corporate evaluation. In Germany corporate evaluations are mostly orientated on the IDW-Standard, which is a practical guideline. The assignment is based on the IDW-Standard. The number of mergers and acquisitions has increased since the beginning of the 1990s. Firms buy and sell whole or just parts of a company to complete their own portfolio or to improve their value chain. Furthermore, firms have to buy or sell other firms to cope with competition in the future. For a corporate evaluation it is important that companies are economic separated. But it is not relevant whether a company is legally independent. Within a corporate evaluation it is relevant that one method is used consequently. Different methods can influence the results in a negative way. There are some laws and legal decisions which are important for a corporate evaluation and the decision making process. The legal base is different in each country so it is relevant to check the legal circumstances before. In Germany i.a. the “Wertpapiererwerbs- und Übernahmegesetz”, the “Aktiengesetz” and the “Wertpapierhandelsgesetz” include relevant regulations for an evaluation. The IDW-Standard is used as a guideline for corporate evaluations in Germany. Everybody who evaluates a company has to follow the regulations in the IDW-Standard. The newest version “IDW Standard: Grundsätze zur Durchführung von Unternehmensbewertungen (IDW S 1)“ is from 2008. Each corporate evaluation has its own occasion. The result of a corporate evaluation is directly connected to the occasion. Therefore, it is important to define this purpose for all evaluations. An evaluation is based on a free or forced change in the owner structure. The calculated value of a company is connected to the aims from seller or buyer. The value can be separated in a subjective and objective value. The objective value is just based on hard facts without individual preferences of seller or buyer. The subjective value includes personal requirements of the parties. The price which will be paid can differ from the calculated price. Corporate evaluations are made for different purposes. The value cannot be calculated exactly. The result is a margin between the lowest price which a seller should get and the highest price which a buyer should offer. Without a purpose a company does not have a price. The price of a company is strictly directed to a purpose. The price which is calculated with a special purpose is just an orientation for the buyer and seller or for a third party like an arbitrator who tries to find a decision. A neutral expert takes the objective value of a company. If the expert supports the seller or the buyer he will take a subjective value. He tries to support his client in the best way. If the client is the buyer he tries to reach the lowest price and if he is the seller it is the other way round. All calculated prices are just an orientation. The price which will be paid can differ significantly. The liquidation value is the smallest value of a company. The value orientates on the financial advantages of the alternatives between liquidation vs. continuation of the company. In this case, the value does not depend on the opportunities of the buyer and the seller, just the given facts are required. This approach focuses on the closure of a company. Theoretically, the company will be divided in pieces and all pieces will be sold. The sum of all sold pieces represents the value of the company. The company should be liquidating when the offered selling price is higher than the liquidation value. The reproductive value focuses on a rebuild of a company. The costs of a rebuild are the central issue which influences the value of a company in the reproductive value approach. In this approach it is necessary to separate between the operating and non-operating assets. The reproduction costs for the operating assets have to be determined. For the non-operating assets, the liquidation value has to be determined. Nowadays this approach is not realistic and there are better possibilities to calculate a company’s value. This approach focuses on the present situation, but the future situation, which will be important in other approaches, is more essential for a fair value. Reed says that the discounted cash flow methods are the only way of evaluating an operating company in a proper way. For investors of a company the cash flows describe the expected payments. Therefore, the DCF methods based on the company’s discounted future cash flows to evaluate its present value. The future cash flows represent in this regard the available payment surpluses for continuation the company’s business and are at the same time as above mentioned considered as the theoretical distribution to the investors. Cp. Wilde, O. (1998), w/o p.
 Cp. Ernst, D., Häcker, J. (2011), p. 364. Cp. Frère, E., Schyra, A. (2011), p. 5. Cp. DeYoung, R., Evanoff, D., Molyneux, P. (2009), pp. 88-93. Cp. Ballwieser, W. (2007), p. 6. Cp. Dombret, A. (2006), p. 40; Hirte, H. (2002), p. 315. Cp. Born, (2003), p. 17. Cp. Dombret, A. (2006), p. 15. Vgl. Mandl, G., Rabel, K. (2002), p. 7; Peemöller, H. (2005), p. 5. Cp. Drukarczyk, J. (2007), p. 93. Cp. Ballwieser, W. (2007), p. 1. Cp. Helbling, C. (2004), pp. 52-53. Cp. Munkert, M. (2005), pp. 58-59. Cp. Brück, M., Sinewe, P. (2010), p. 52. Cp. Mensch, G. (2002), p. 258. Cp. Ballwieser, W. (2007), 190. Cp. Ernst, D. et al. (2011), p. 3-4. Cp. Reed et al. (2007), p. 108. Cp. Hasler, T. (2011), p. 161. Die Wertrelevanz von Jahresabschlussinformationen zu Finanzinstrumenten: Wie relevant ist die Fair-Value-Bewertung? Repatriation – why and how to succeed? Internationale Transferpreissetzung und der "European Code of Conduct"